Spotlight on St Martin de Belleville – Five Reasons to keep it to yourself, Shhhhh! Blog / Uncategorized / Spotlight on St Martin de Belleville – Five Reasons to keep it to yourself, Shhhhh! Picture a small alpine village where the only high-rise is a baroque church, twinkly fairy lights illuminate the cobbled streets and snowy chalet rooftops mingle with rustic barns… St Martin de Belleville is a truly authentic mountain village: in summertime you’ll see more cows than humans and during winter, the civilised buzz in the streets is from happy skiers who’ve just enjoyed a vin chaud before heading back to the chalet hot tub. The views from your chalet window of the surrounding peaks make a beautiful backdrop for a truly relaxing holiday. With the peaceful atmosphere and low-rise Savoyard architecture, you’d be forgiven for thinking you were on holiday in an unheard-of resort with just a handful draglifts for entertainment. No way, José – you have 600km of skiing to play in! 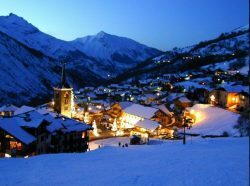 Just two speedy lifts and you’re at the top, ready to head to Meribel and beyond… And at 1450m altitude, the village of St Martin de Belleville is at just the same level as Meribel! Any seasoned visitor to the Three Valleys will recommend that you ski a piste called Jerusalem. An undulating blue run which winds down into St Martin, it has beautiful views and is famous for a reason. One of the best things about staying in St Martin is that if you have a wee drinkie at the top at the end of the day, you’ll have the run to yourself on your way home. Every day! 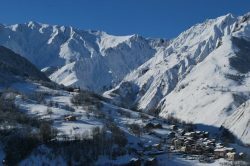 Home to the Three Valleys’ only 3 star Michelin restaurant (La Bouitte), it’s no wonder St Martin de Belleville was named ‘Gastronomic Resort of the Year’ in the World Snow Awards. But this accolade was not only awarded for those iconic stars: try La Ferme, a restaurant on a working farm; fine dining in the smart local hotel; authentic Savoyard ambience in Le Montagnard; or why not take a snow-shoe walk to the dairy that produces incredible local cheeses? With two gorgeous spas, a fab selection of restaurants and some beautiful walking tracks through the woods, St Martin is not just a haven for those who love the thrills and spills of the slopes. 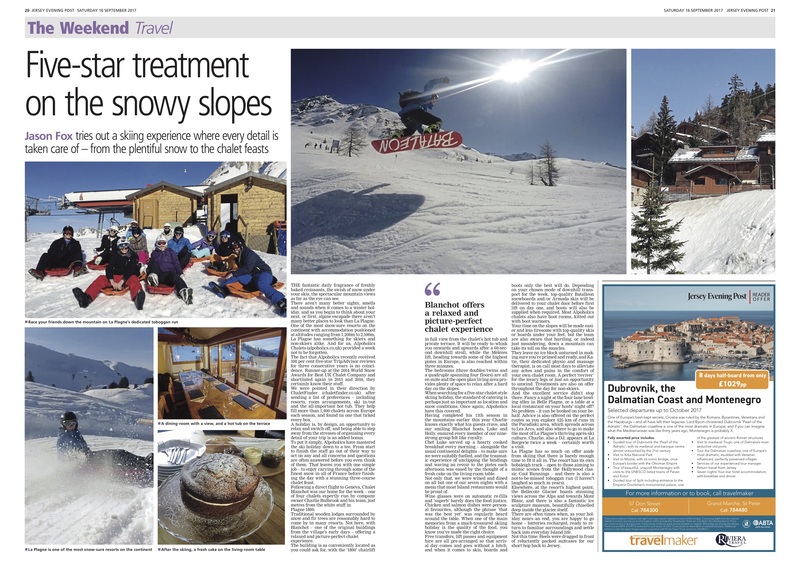 Regulars to St Martin may ski a couple of mornings or not at all, preferring to relax in the beautiful surroundings, whilst those with young children enjoy strolls into the village to drink coffee, build snowmen or take rides on the lifts with pedestrian passes. There are even more options further afield if you drive! So you can see, there are at least 5 reasons to keep the beautiful St Martin de Belleville a big secret. Unspoilt mountain resorts with access to a vast ski area are few and far between these days, so shhhh! Mum’s the word, OK? Be sure to take a look at the Ski Talini chalet collection and don’t hesitate to contact us at ChaletFinder if you need help with finding your perfect accommodation to discover the wonderful St Martin de Belleville. 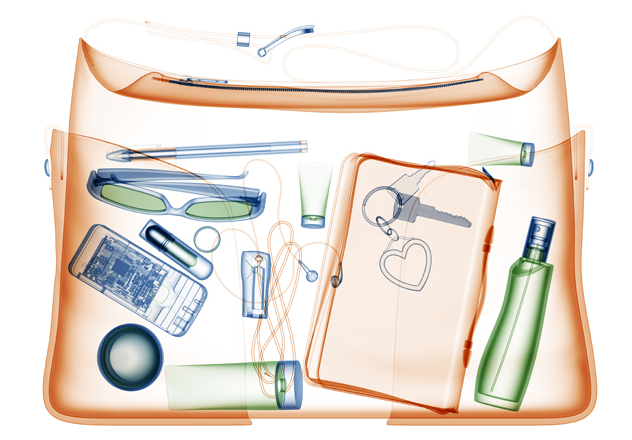 What can I take in my hand luggage on board the plane?